Peggle is a puzzle game which first appeared in 2007. 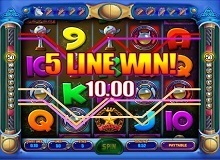 The slot has been a success since its creation, and it was named to be among the most addictive games in the industry. The arcade design used to create the 50 payline, 4 rows and 5 reels slot have helped to increase its popularity. There are several levels for gamers to play their way out. The aim is to clear the pegs as you play on the different levels. This slot by Blueprint Gaming has a mechanical feel which sets a fantastic tone making players feel like they are playing a real arcade game. Try to reach the end of the game to be awarded big wins. It is compulsory for the player to bet on all 50 paylines which increase their chances to win. The betting range is also wide to cover both low and high rollers. Gamers who wish to play Peggle for real money will bet with as little as £0.50 to as much as £500. The paytable is found by clicking the info button found below the reels. The paytable shows your wins and the rewards of different icons in the slot. 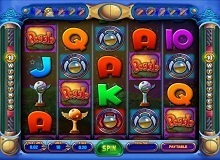 The slot also features an autoplay option which the player can click to play continuously for at most 50 spins. 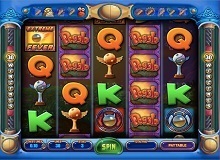 The player should match identical icons on an active payline from the left side to right to form a winning combination when playing Peggle casino slot online. The top value symbols will pay when you land two of a kind on adjacent reels. Five red or blue Peggle icons pay 400 coins. The player is paid 300 coins when they get a full house of silver or gold trophies. The most rewarding symbol in the game is the Peggle title. Five of these icons on the reels pay 500 coins. One will also get the jackpot amount of 25,000 coins when the paying title icon fills the entire reels. Standard symbols in the slot are 9 through Ace playing cards. The game features a decent RTP of 95.15%. The featured bonus rounds make it more interesting to play Peggle slot machine online. 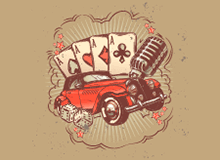 There are several bonus rounds to be achieved in the casino online game. The bonus features below give the player the best playing experience. Gold Star – The gold star symbolizes the wild icon. It stands for all the other symbols on the reels to help them form a winning combination. It, however, does not replace the extreme fever scatter symbol. Extreme Fever – This is the scatter icon in the game. The symbol will reward the player irrespective of where it lands on the reels. Enough of the extreme fever scatter icons anywhere on the reels will trigger the games bonus feature. Peggle free slot machine offers an awesome and unique gaming experience to players. The video game has a medium volatility which balances the player’s chances to win and interesting gameplay. It is a little difficult to unlock the free spins round but quite interesting when you manage to trigger it. The gameplay is designed with a fascinating game system which makes the player play for long without getting tired. It is available at online casinos and can be played on mobile devices.